Recent pro-Iranian and Syrian regime remarks by an Afghan Shiite leader may attract regional sectarian rivalries to Afghanistan, and incite more violence and terror by the Islamic State terrorist group in the war-torn country, analysts warned. Deputy Afghan Chief Executive Mohammad Mohaqeq, a leader of the country's Shiite minority, said last week, "I thank all the warriors who cooperated in these wars from Iraq, Syria, Afghanistan, Pakistan and other parts of the world." He was speaking about fighters in Syria while addressing an international summit of scholars from Iran and other Muslim nations in Tehran. Mohaqeq called it Islam's war against infidelity and world arrogance. He was praising foreign fighters, including Afghans, who fought in Syria alongside the Lebanese militant group Hezbollah and Iran's elite Islamic Revolutionary Guards Corps (IRGC) in support of the government of Syrian President Bashar al-Assad. Mohaqeq, who led one of the warring parties that engaged in a brutal civil war that killed tens of thousands of Afghans in the early 1990s, also praised the role of Major General Qasem Soleimani, who commands IRGC's foreign operations, and Hezbollah leader Hasan Nasrallah, whose forces are engaged in various conflicts in the region. 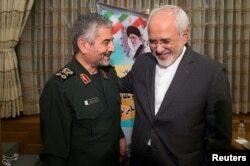 Islamic Revolutionary Guard Corps (IRGC) commander Mohammad Ali Jafari, left, and Iran's Foreign Minister Mohammad Javad Zarif smile during a coordination meeting for the 40th anniversary of the Islamic Revolution, in Tehran, Iran, Oct. 9, 2017. ​Two days after Mohaqeq's speech in Tehran, Afghanistan's acting minister of defense, General Tariq Shah Bahrami, stood next to Saudi Crown Prince Mohammed Bin Salman at the inaugural meeting of the Saudi-led Islamic Military Counter Terrorism Coalition (IMCTC) in Riyadh. Saudi Arabia and Iran are regional rivals. Afghanistan's government and many of the country's lawmakers reacted strongly to Mohaqeq's remarks, insisting they are not representative of the country's foreign policy. "Recent comments by Mohammad Mohaqeq in Tehran are in contradiction of the principles of foreign policy, national interests, stability and security of the country and the laws of Afghanistan, and in no way represent the views of the Afghan government," Kabul said in a statement this week. Fazal Hadi Muslimyar, chairman of the Afghan Senate, demanded the Mohaqeq apologize and be prosecuted. Analysts charge that the controversial remarks are an open invitation for the regional rivalry to engulf Afghanistan, which is already suffering from decades of alleged interference by its neighboring countries. "Mohaqeq's remarks can certainly incite rivalry [between Iran and Saudi Arabia] in Afghanistan," Wadir Safi, a professor of law and political science at Kabul University, told VOA. "The Iranians had asked him to make those remarks to counter Saudi Arabia politically and militarily, and to start a proxy war against Iran's opponents in Afghanistan," Safi added. The Saudi-led Muslim counterterrorism coalition is largely believed to have been created to counter the growing influence of Iran and its proxy militants groups, such as Hezbollah and the Houthi rebels in Yemen. Riyadh is leading a military alliance against the Iran-backed militant group that overthrew the Yemeni government in 2014. "Escalation in the Iran-Saudi rivalry will have a negative impact on the situation in Afghanistan and the wider region," Dawood Azami, a researcher at the University of Westminster, told VOA. "The growing competition for regional dominance between Riyadh and Tehran will put more pressure on the government and powerful figures in Afghanistan to take sides." Abdullah Sharif, a former diplomat and author, said Mohaqeq's remarks can create serious foreign policy challenges for Kabul. "Afghanistan is trying to stay out of regional conflicts by not officially siding with one group or another. Mohaqeq's statement, if not officially denounced by the government, will undermine that stance," Sharif said. FILE - In this Nov. 24, 2016, photo, tribesmen loyal to Houthi rebels hold their weapons as they chant slogans during a gathering to mobilize more fighters into battlefronts in several Yemeni cities, in Sanaa, Yemen. In addition to making Afghanistan an arena for regional rivalries, analysts warn the remarks may provide an excuse for the Islamic State terror group to become even more violent in Afghanistan. The group has already claimed responsibility for several deadly attacks across the country. "Mohaqeq's statement could lead to an increase in IS violence against the Shiites in the country," a Kabul based activist who belongs to the Shiite minority told VOA on condition of anonymity for safety reasons. Kabul university's Wadir, however, believes Mohaqeq's stance could incite IS violence not only against the Shiite but also against Sunnis in the country. Over the years, Iran has reportedly sent thousands of Shiite Afghan refugees to Syria to fight in support of the Assad regime. The Afghan fighters are part of the "Fatemiyoun Brigade," the second-largest group of foreigners fighting for Assad in Syria. Western media estimate they have 10,000 to 12,000 fighters. A recent Human Rights Watch report accused Iran of committing war crimes by recruiting and sending Afghan refugee children "as young as 14" to fight in Syria. The prospects of Afghan fighters returning home after the war in Syria is over is worrisome for Afghans. "This is quite dangerous: What happens to this Fatemiyoun force when the war in Syria is over?" Rahmatullah Nabil, a former Afghan intelligence chief, recently told The New York Times. "The fear is that rivalry in the region, between Iran and Saudi, will shift to Afghanistan. And I think that clash is already shifting here," Nabil added. Azami, of Westminster, echoed Nabil's concerns and said IS's goal in Afghanistan is to turn the country's conflict into a sectarian war between the minority Shiite and predominant Sunnis, and remarks like those made by Mohaqeq in Iran may help contribute to the realization of that goal. "Referring to some of its attacks in Afghanistan, IS has said that they were in retaliation for the support of Afghan Shiite militia to the Syrian regime," Azami said.